Chatsworth - Schneiderman Insurance Agency, Inc. The history of Chatsworth traces back to the Fernandeño and Chumash Native American tribes thousands of years ago. 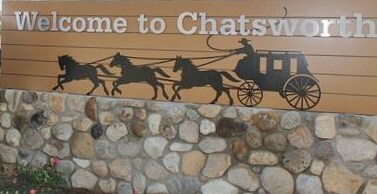 Chatsworth borders the Santa Susana Pass, which stagecoaches would have to traverse while traveling the Overland Stage Road between Los Angeles and San Francisco. Chatsworth was an active stop for the stagecoaches as late as 1891. The Stagecoach Trail can still be seen today in the foothills of Chatsworth. The town of Chatsworth officially became a part of the city of Los Angeles in 1915. Chatsworth has a history of being known for its equestrian community. The community was often used in the 1920s as a filming location for many western movies as the scenery of the area lent itself well to the Hollywood studios that were close. Chatsworth is the home to many well-known Schools. Sierra Canyon School, Chatsworth Hills Academy and Chaminade College Preparatory School are well known private schools, and Chatsworth High School is the local public High School with alumni such as Kevin Spacey and Matt Cassel.The area is home to several Los Angeles historical Monuments. Los Angeles historical monument 14, the Pioneer Church. Located at 22601 Lassen Street, the Oakwood Memorial Park also known as the Pioneer Church was constructed in 1903. The Pioneer Church is the oldest public building is the community. Los Angeles historical monument 92 is the Stage Coach Trail in the Santa Susana Mountain Park. The Stage Coach Trail has a history dating back to the 1860s linking the areas of Los Angeles, Encino, Simi Valley and Ventura. Los Angeles historical monument 645 is the Harvester Barn. Harvester Farms was the original home of the Palomino Horse Association of America and the birth place of Mr. Ed.